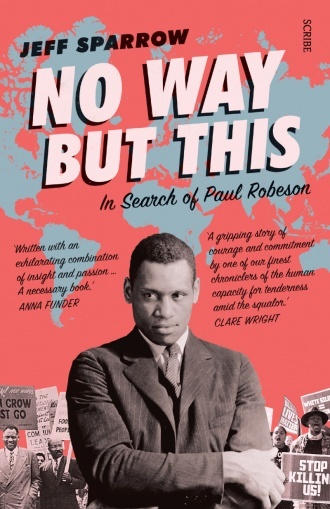 IN NO Way But This, Jeff Sparrow recounts a personal pilgrimage from his native Australia to places around the world Paul Robeson visited, while assessing the impact his life continues to have today. From Sydney — where Robeson’s career ended in 1960 — Sparrow continued via Greensboro and Williamston, North Carolina, where his father had been enslaved, to Robeson’s birthplace in Princeton, New Jersey, and Harlem, New York, where he lived most of his adult life. He travelled on to to London, where Robeson lived and visited on-and-off for several decades and Wales, where his political education began. Thence to Spain, where Robeson and his wife Essie went during the Spanish civil war and finally to Moscow, scene of many Robeson triumphs and a spectacular mental breakdown. This is a travel diary in which Sparrow lyrically recounts conversations he had, buildings he visited, streets he walked down and landscapes he traversed in his quest to understand Robeson’s thoughts, motivations, influences and legacies. He meets BBC Wales’s Beverley Humphreys, who had organised a Robeson exhibition, talks to school children about what he had stood for and to now-elderly black Welsh people who fondly remember being child extras in the film Proud Valley in which Robeson starred. Such personal reflections make this more an exploration of Robeson’s contemporary legacy than a biography. He draws on many existing Robeson biographies to both give the facts of Robeson’s life and as his travel guides as he set off on an itinerary that would allow for some spontaneity in the midst of whatever planning he had done. He describes narrowly avoiding being forced to view the corpse of a black activist lying in state in Harlem just because that happened to be where the person that an academic suggested he interview was going that afternoon. The subsequent conversation was about the gentrification of Harlem and of the prison-industrial system, both of which illustrate a damning lack of progress made decades after Robeson. Sparrow finally describes a visit to the Graveyard of Fallen Heroes in Moscow. Here, wandering among toppled statues of significant players in the Soviet project, he reflects on how far the world has fallen from those ideals and how new dictators will always replace old ones unless we remain mindful of those stories that the authorities seek to suppress. Sparrow’s book is a very effective and compelling way of introducing Robeson to readers not so interested in conventional biographies. Yet the section misleadingly described as “further reading” is actually a bibliography, listing the author’s research sources, many of which had nothing at all to do with Robeson. This is exacerbated by an absence of footnotes and a wholly unsatisfactory reference section and several factual inaccuracies in the body of the book. Such gripes aside, I greatly enjoyed No Way But This and admire Sparrow’s use of his and others’ personal perspectives to cast new light on this towering figure, whose long shadow can be perceived almost physically everywhere he went and beyond. Tayo Aluko is the writer and performer of Call Mr Robeson – A Life, With Songs and of Just An Ordinary Lawyer. A fuller version of his review is available at Camden New Journal. This entry was posted in Human rights, Music, Racism and anti-racism and tagged Paul Robeson by petrel41. Bookmark the permalink.